My Loaded Baked Potato Dip gets devoured every time I make it–it’s one of our all-time favorites! With only five ingredients, it’s a cinch to make up and can be made ahead too! 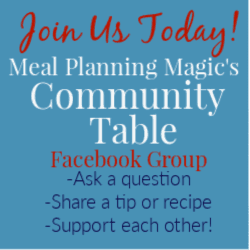 CLICK HERE to save this recipe to Pinterest so you can remember to make it later too! Many years ago, I worked in a bank in the marketing department and that’s when I was first introduced to this Loaded Baked Potato Dip. 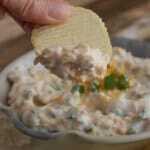 Part of our job was to provide food for the company meetings and my boss at the time made this dip for EVERY meeting. Apparently it wasn’t just a tradition, it was an expectation. Even nearly two decades later I know why. It’s SO delicious and super addictive! 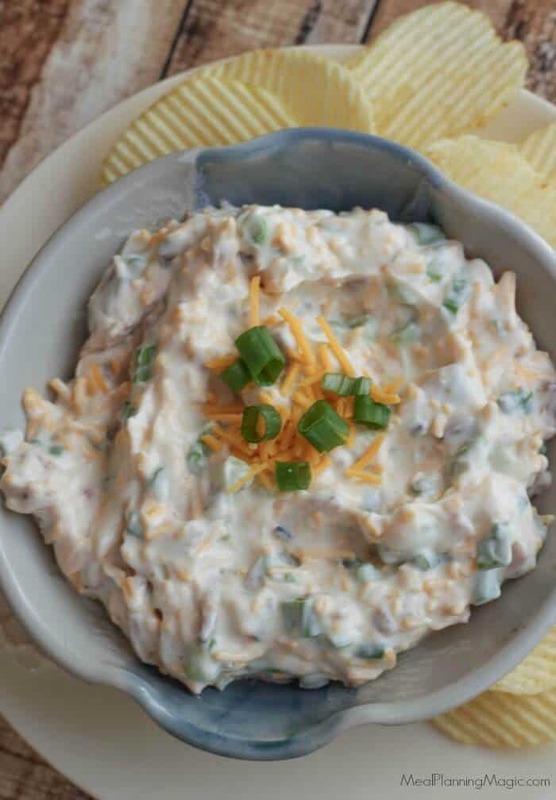 I started making it for my friends and at family gatherings and before long it became “Brenda’s Baked Potato Dip”. I couldn’t go anywhere without someone requesting I bring this dip! People asked for the recipe. They started making it. Then it became known as “their” dip. Let it be known, I may not have invented this Loaded Baked Potato Dip, but I’ll still claim it as my own and the original sharer in my local neighborhood. 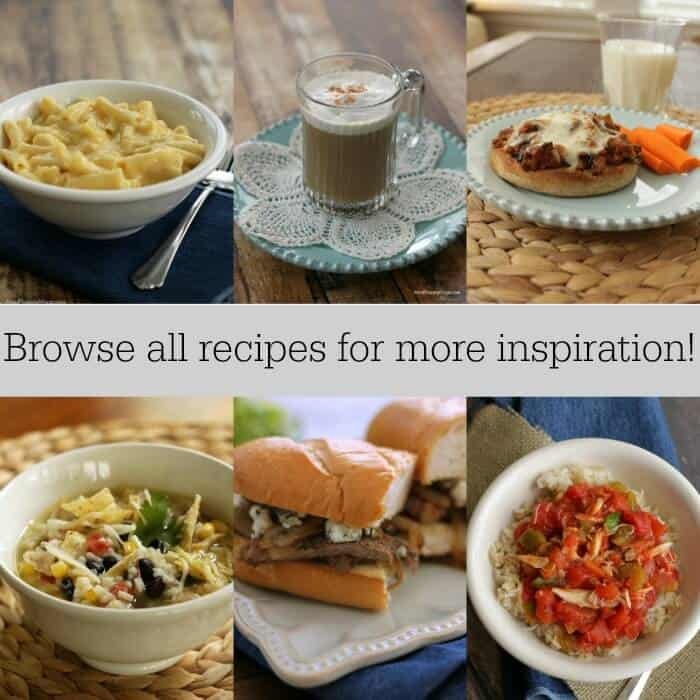 I even shared it on AllRecipes many, many years ago so if you search there, you’ll find my name alongside one of the recipes! Now some of you may be saying “But Brenda, how can it be called Loaded Baked Potato Dip if there are no potatoes in it?” I actually get this question a lot! 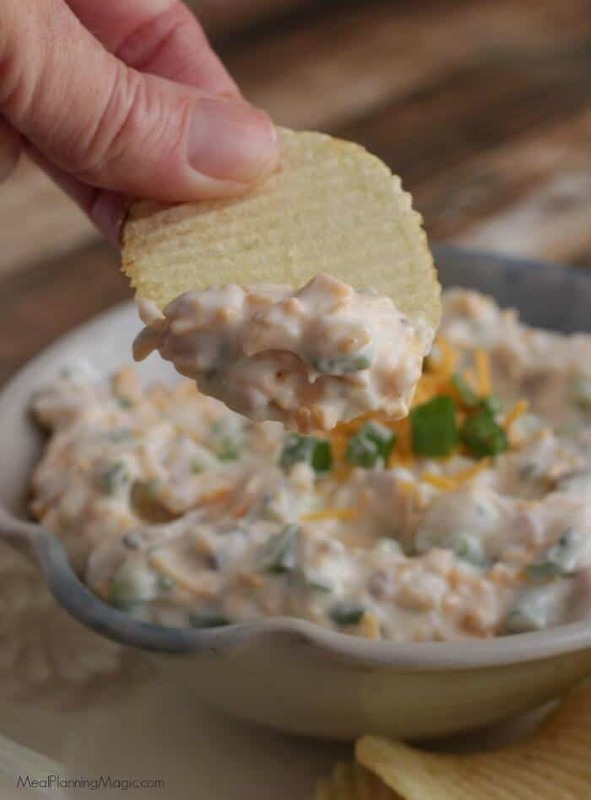 But here’s where you use your imagination and think of this dip as all the yummy toppings you might put on a baked potato that are now dip-able (is that a word) because you eat it with potato chips! (there’s your potato–and where you might need to use your imagination). I promise, the flavor is still super yummy and you’ve now got yourself a new way to enjoy an old favorite! I’ve lightened it up over the years using plain Greek yogurt for some of the sour cream. If you have a mild, creamy yogurt (I like the Greek yogurt from Costco), you can substitute all of the sour cream with yogurt if you like. 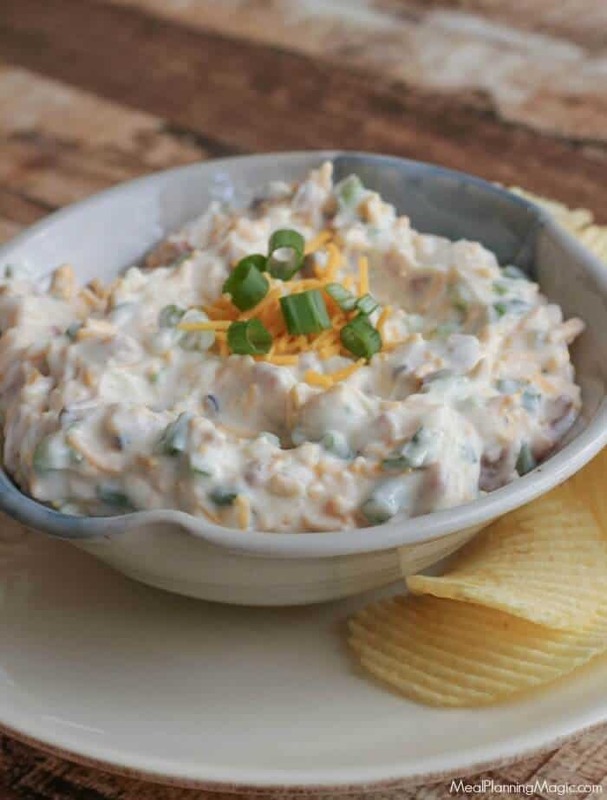 Combine sour cream, yogurt, bacon pieces, cheddar cheese and green onions in a mixing bowl; stir well. Refrigerate, or serve immediately with potato chips. There were so many great cooks at that bank…I got so many great recipes from coworkers! One of my other favorites are these Soft and Chewy Molasses Ginger Cookies. This Loaded Baked Potato Dip is super simple to whip up and now my teenage daughter even makes it herself. It’s great for any occasion but especially during the holidays or for tailgating. I hope you’ll give it a try!